"The worlds of tomorrow will rise up from the foundations we establish today." How quickly can you adapt to the ever-changing landscape of Hardwired, the fourth pool of cards for Android: Netrunner draft play? It’s time to find out. Hardwired Draft Starters, Corp Draft Packs, and Runner Draft Packs are now available via FFG’s in-house manufacturing! The Hardwired draft pool incorporates 240 cards downloaded from the whole network of Android: Netrunner products, including more than two dozen preview cards from the upcoming Mumbad Cycle. You’ll also find considerable changes to the Hardwired Draft Starter, including the addition of seven new identities, one for each core Corp and Runner faction. Test these new identities and put your Mumbad preview cards through their paces. In Hardwired, you’ll find new reasons to tinker with your rigs and servers. You’ll also find more emphasis than ever placed upon the game’s tumultuous mid-game, when both Corp and Runner are scrambling to gain whatever advantages they can. In your Hardwired draft games, the back-and-forth interactions of the mid-game are more than a phase through which your games must pass; they’re the root code from which the set was developed! What is most compelling about Android: Netrunner draft play? Some may argue it’s the fact that everyone starts on equal footing; newcomers enter a draft with just as many cards as the veterans, and they have the same opportunities to discover the synergies within the cards they see as their opponents. 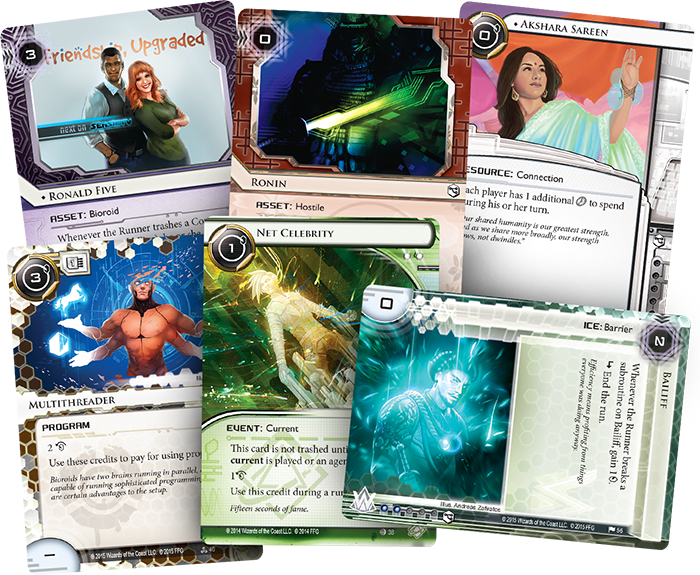 Others may argue that the preview cards are the most exciting aspect of each new Android: Netrunner draft set. They offer you glimpses not only into the contents of the upcoming cycle, but also hands-on experience as to how the cards might play. After all, even though these cards aren’t tournament legal until they appear in a standard LCG® product, there’s nothing to stop you from putting them into decks that you use in casual matches with your friends. Of course, neither of these arguments are wrong, and what one finds most compelling about Android: Netrunner draft play is—in the end—entirely subjective. Still, the nature of draft play, itself, leads one to believe that participants are lured largely by the very challenge of building a deck from the ground-up, starting with the very construction of an event-specific collection, and the Hardwired draft set enhances this aspect of draft play by introducing seven new identity cards: three for the Runners and four for the Corps. 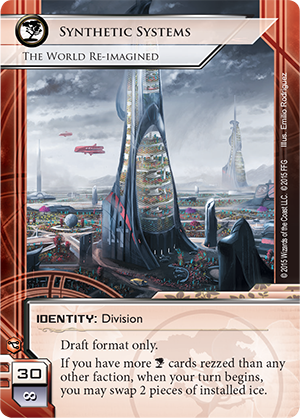 These “Draft format only” identities are not legal in standard play. Click on any of the identity cards to view a larger image. 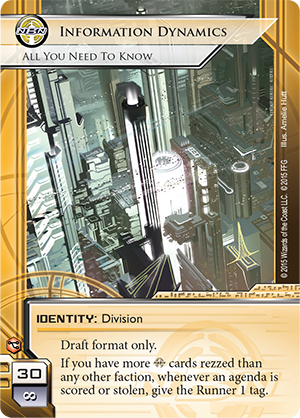 Each of these new Runner and Corp identities comes with a unique ability that not only presents you with advantages throughout your cyberstruggles, but also rewards you for strategic deck design and tactical play. They also reinforce the draft set’s focus on the mid-game as each encourages you to develop your side of the table even as you’re doing your best to disrupt your opponent’s. Each player participating in an Hardwired draft will need to bring three items: a seventeen-card Draft starter and two forty-card Draft Packs, one each for Corp and Runner. Alternatively, groups with even numbers may split so that half the players draft only Corp cards while the other half drafts only Runner cards. In such drafts, each player only needs the Hardwired Draft Starter and a single Draft Booster. The Hardwired Draft Starter is a fixed collection of rules and seventeen utilitarian cards that include four draft-only Corporate identities and three draft-only Runner identity. 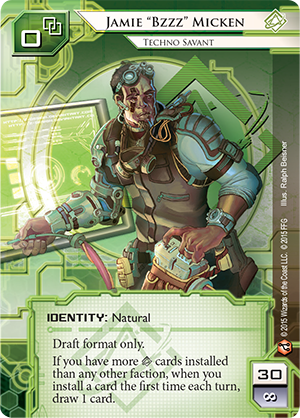 In addition to its identities, the Hardwired Draft Starter contains five agendas, one icebreaker, and four basic economy cards to get you started along the path to success. 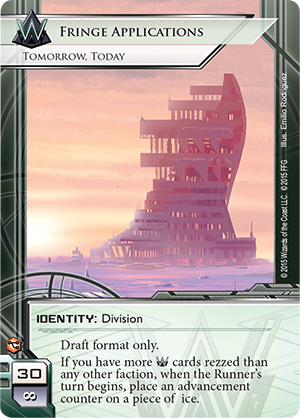 As with all Android: Netrunner draft sets, the cards in this Draft Starter are clearly distinguished from both the larger Android: Netrunner card pool and the cards in the Hardwired Draft Packs, allowing you to collect them after your games and prepare for your next draft. These Draft Starters are reusable, so you only need one, no matter how many Hardwired drafts you play! All draft cards are clearly identified by a new icon, and starter pack cards are further distinguished from draft cards by color. Randomized Hardwired Draft Packs for Corp and Runner are compiled according to a custom algorithm from a card pool of 240 cards called Hardwired. All cards found in Hardwired draft products, except for those marked “draft format only,” are legal in standard tournament play as soon as they are tournament legal and released within the standard LCG format. Accordingly, each card from the Mumbad Cycle will become legal for tournament play once the LCG Data Pack in which it is contained goes on sale at retailers. Note that, because of variations in production color and card-stock resulting from our in-house manufacturing, players using draft cards in tournaments must sleeve their cards with opaque or art sleeves. 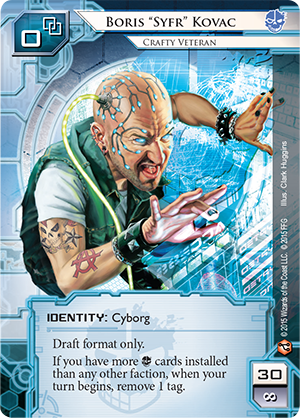 How quickly can you process the myriad challenges of Android: Netrunner Draft Play? Compile your cards, advance your agendas, and launch your runs in the exciting Hardwired draft pool for Android: Netrunner! Pick up your Hardwired Draft Starter, Corp Draft Pack, and Runner Draft Pack today! 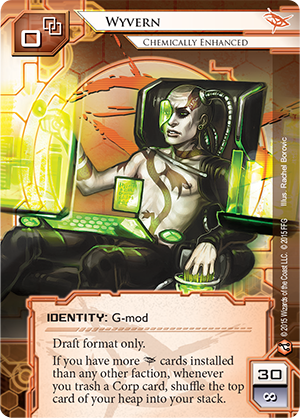 Note: Android: Netrunner draft products do not serve as a replacement for the standard Android: Netrunner LCG model. 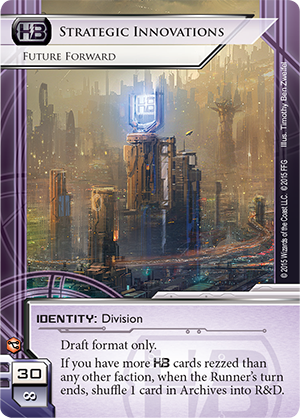 Instead, Android: Netrunner draft products allow players to enjoy the game through an additional format of play. Orders for products printed via FFG's in-house manufacturing may take 10 – 14 days to ship.